The Government is providing funding of £150 million per annum for the academic years 2013-2014, 2014-2015, 2015-2016 and 2016-2017. The Government has also made a commitment to continue funding schools until 2020. This funding is being jointly provided by the Departments for Education, Health and Culture, Media and Sport. The money will go directly to primary school head teachers to spend on improving the quality of sport and P.E. for all of their children. Schools must spend the additional funding on improving their provision of P.E. and sport although how they do this remains their decision. Brook Street will receive a funding to the sum of £8,000 plus £5 per pupil. At Brook Street, we recognise the contribution of P.E. to the health and well being of the children. We believe that an innovative, varied P.E. curriculum and extra-curricular opportunities have a positive influence on the concentration, attitude and academic achievement of all our children. Our Primary School Sports’ Funding will enable us to continue and extend our provision through employing additional sports professionals, entering into more competitive sports, competitions, training our staff to deliver in-house quality P.E. sessions and purchasing new, interesting resources. How Will Brook Street be using the funding? • Hiring specialist coaches/P.E. professionals to work alongside our teachers during lessons. • Hiring professional coaches to deliver after school clubs for our children. • Providing release cover for the P.E. subject leader to attend training, to monitor the current standards of teaching and to support staff in their own development. • Buying interesting and exciting resources for our children to use during lessons, at break times and in after school clubs. • Buying quality assured professional development resources for teachers. • Working alongside our Carlisle South Cluster Schools to increase the number of sports leagues/competitions across the year for our children to take part in. • Identifying pupils who have a talent and support them financially to attend out of school sports clubs. • To pay for transport needed to get to sports events. • Increase in participation rates in sports clubs. • Improvement and development of physical skills for the children. • Success in competitive school sports. • Quality of P.E. teaching throughout the school and the improvement of staff knowledge in teaching P.E. • Continued partnership work on Physical Education with other schools within our cluster, with the University of Cumbria and our local secondary schools. At Brook Street School we have spent our sports money in a variety of ways. At the forefront of our planning was ensuring that every child received a better physical education as a result of the additional sports funding in school. We have aimed to increase participation rates in our after school clubs, to become more successful at competitive sports within our schools cluster. To provide children with excellent physical education through the continual professional development for all our staff. To highlight the importance of physical education and its impact on; self- confidence, self -esteem, academic achievement and promote a life- long enjoyment of sport and exercise as well as an understanding of the health benefits to this. Below we have detailed what we have spent our sports funding money on and how it has had an impact on the children in our school. In addition to the government’s requirements for children to learn to swim. Brook Street provided an additional 2 year groups to attend swimming at The Pools Carlisle. Children from Year 1 and 2 attended swimming for 6 weeks per year group. We have spent £650 on the use of RRCA facilities including undertaking multi-skills activity mornings and additional sporting activities. We have spent £250 on paying for 2 members of Brook Street staff to coach the school’s football team. Children receive coaching and training during an afterschool club. Children compete in local cluster competitions and also have competed in additional competitions. We spent £85 on supply cover so that our PE co-ordinator could attend the ACPEN meeting. This course gave the PE co-ordinator information of how to develop P.E. in Brook Street School; curriculum, progression and also use of Sports Premium- use of Sports Premium for additional health reasons. We have spent £50 on entering 2 different football competitions which will be held at The Sands Centre. Children will compete against local schools within the competition. We have booked for the two members of staff who coach the football team to have accredited training. Staff will develop their knowledge of coaching football. After SATs, children in year 6 will compete a block of swimming session held at The Pools. This is to ensure that all children leave primary school with the ability to swim a minimum of 25m. We aim to purchase new netball posts which can also be used as basketball nets. These need to be easy to assemble which children can be trained to set up with adult supervision. We aim to purchase new mats for gymnastic and floor based activities. Continuing with the success of last years sports day we aim to replicate this. Monies will be spent for hiring porta-loos, additional equipment and healthy refreshments for the children. We will purchase the Cambridgeshire P.E. scheme of work. This scheme has been recommended within ACPEN meetings. The scheme of work clearly shows progression within many different sporting elements. Teachers are able to use the scheme as a full package, however teachers are able to adapt and change elements for their class. We will purchase new play equipment for children to use during playtime and lunch times. Children from older years will be trained of how to use the equipment and how to encourage other children to use the equipment for different purposes e.g. creating new active games. As a school we want to offer each child a piece of fruit or vegetable at break time each school day. Children will have a variety of different seasonal options which will be delivered fresh to school regularly. In addition to the government’s requirements for children to learn to swim. Brook Street provided an additional 2 year groups to attend swimming at The Pools Carlisle. Children from Year 1,2 and 3 attended swimming for 6 weeks per year group. As a result of children learning skills associated with swimming Years 1 and 2 will continue the swimming sessions during the academic year of 2016-2017 to further their skills within swimming. We have spent £650 on the use of RRCA facilities including undertaking multi-skills activity mornings. In addition to using the facilities RRCA sent a P.E. teacher to deliver gymnastics to children in Year 1. Children were able to develop their skills within different gymnastic areas are some children were ready to compete in a cluster schools gymnastic competition. Children show interest and want to compete within cluster school sporting events. Children who attend the club gain additional teaching and experiences including sportsmanship. We will continue this club in the new academic year. We have spent £4000 on developing the outdoor provision. Although the size of the area has not increased the ability to complete sporting activities has been increased due to the removal of structures. Children use the outdoor area to undertake a variety of activities including gross motor fitness activities. Children enjoy the outdoor area which is evident through their play and movement, furthermore children respect the outdoor environment. We have spent £200 on our school Sports Day. In the past sports day has been undertaken on school grounds, however after discussion with varies stakeholders within the school the decision was made to have our sports day at Richard Rose Central Academy’s field. RRCA allowed Brook Street to use the facility for free however monies were spent on hiring porta-loos, water for throughout the day and fruit. Discussion with parents after the event commented on how much they had enjoyed watching their children race and compete in a different environment. As a school we all enjoyed the day and would like to replicate the success of the day next year. As continued from above- To undertake some different activities for sports day additional equipment was required. We purchased new athletics equipment for throwing for distance. The new equipment has replaced some of the previous equipment within the school. The new equipment has replaced some previous equipment that could not be used effectively. School will continue to develop skills needed for next year’s sports day and repeating the success this year’s sports day. We have spent £4250 on sports coaching in school. We receive a full day of sports lessons for our FSU, year 1, year 2 and year 6 children. The children have been following the objectives set out in our PE long term plan for their year group. This has provided both quality teaching for our children and staff development opportunities for our teachers who have been present in all sessions. As well as a whole day of sports coaching we have received 2 fencing clubs; one after school and one during lunch time. We have found that the children in FSU, year 1, year 2 and year 6 have shown more enthusiasm in their PE lessons. 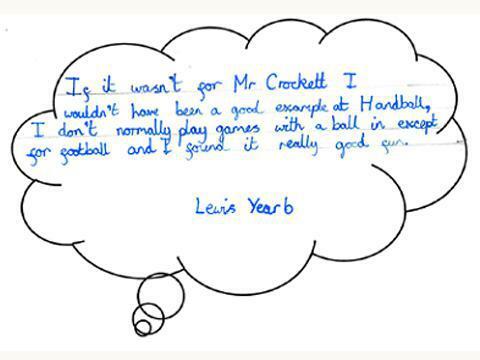 We have attached some children’s responses and it is clear to see that the premier sport coaching has had a positive impact on their physical education. In December 2014 we uploaded evidence of children’s enjoyment and this can be seen in addition to this document. As a school we have taken the decision to invest in our staff knowledge and development and as a result we will not be paying for any premier sport coaching after July 2015. Although it did provide good coaching for the children at our school we believe that our staff have the capability to provide a physical education of an even higher quality. As a result of this decision we aim to provide opportunities for staff development and will be therefore spending our sports funding money in this way. We have paid £2812.84 to have our playground markings re designed and updated. We decided to have zones printed on top of our netball pitch to help when organising children during PE sessions. We updated all our markings to encourage children to continue their physical education at play and lunch times. We have found that children are engaging with the markings during play and lunch times, particularly in key stage 1 where the children have been observed playing hopscotch as well as practising skills they have been taught during PE sessions. 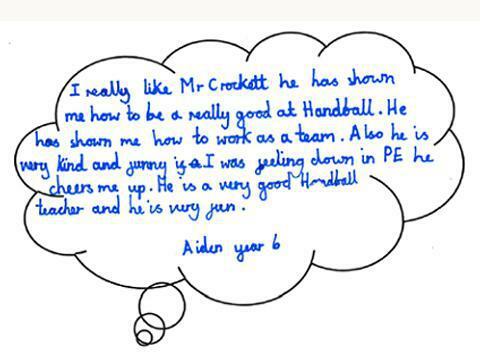 It has been noted by teachers that it is much easier to group children when teaching PE and attached is a testimonial from 2 teachers at our school. As a school we feel that the money has been well spent in this instance. We paid £400.00 for Vanessa Foster to provide 2 staff meetings about teaching gymnastics. She provided both theoretical and practical guidance to all teaching staff and left us with a variety of online support and guidance. Vanessa developed our staff knowledge and understanding of teaching gymnastics. The staff response to her training was positive and everyone left feeling excited to teach gymnastics with their class. (Attached are 2 staff testimonials.) As a school we feel this training was an excellent way to spend our sports funding money; it provided an investment in our staff which had an immediate impact upon gymnastics teaching, and it ensured quality gymnastics lessons for years to come. We will be continuing to up skill our staff in a variety of ways during the course of this academic year. We continue to pay 2 members of staff to run our Monday night football club. This year we have just had our largest number of children (28) joining up for football club and we are hopeful that we will be successful within our cluster league this year. We have seen the highest numbers of children attending our football club and our branching out to have both a girls and boys team this year. We are currently entered into all the girls and boys competitions and are hopeful of success due to the good quality training the children are receiving. Attached are some photographs of our football club along with children’s views. As a school we plan to continue funding our football club using our own staff. We believe this provides value for money and is a sustainable way to spend our sports funding money. We purchased bronze coloured medals with our school logo attached to give to competitors during sports day 2015. As Mrs Ditchburn was retiring we decided it would be nice for each child to be presented with a medal in commemoration of her time as head teacher. All the children received a medal as part of our sports day and were pleased to get them. It is important that children link competition with reward and understand that when competing prizes can be won. As a school we feel that we honoured all competitors’ effort during sports day as well as providing additional prizes for 1st 2nd and 3rd places. We believe that this was a good way to spend our sports funding money. physical education as a result of the additional sports funding in school. as an understanding of the health benefits to this. how it has had an impact on the children in our school. one after school and one during lunch time. positive impact on their physical education. 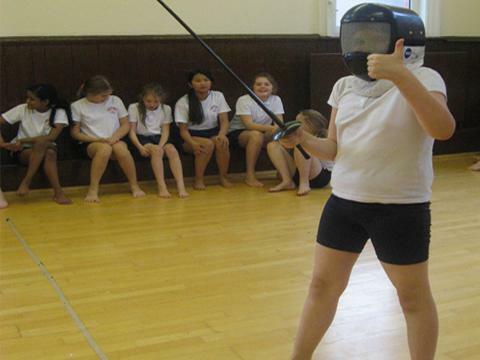 Attached are some of the photos from fencing club and again some children’s responses to taking part. We are really pleased to have had the opportunity to provide our children with a club we would otherwise have been unable to run. We plan to continue using premier sport to coach in school for a whole day and provide us with 2 clubs. In the spring term premier sport will be coaching gymnastics to our FSU, year 3, year 4 and year 5 children. This will carried out as a team teach strategy to provide our staff with professional development and guidance. We have paid £600 to Richard Rose Central Academy to be part of their primary outreach service. For this money we receive 6 hours of coaching at the academy and 6 additional hours of staff development time. Year 2 children have been to Richard Rose Central Academy to take part in a multi skills workshop for an afternoon. They were taught by young leaders from the academy and put many of their PE skills into practise. Year 4 have also been to Richard Rose Central Academy to take part in a Tri-Golf workshop. Our year 6 went to Fellside to complete a Victorian Christmas the activities included; a fell walk, role play – gentry servants, felt making, a visit to Goldscope mine and an educational walk around Caldbeck. They were able to complete some of the OAA objectives for year 6 Physical Education. We spent £165 on supply cover so that our PE co-ordinator could attend the ‘New PE curriculum’ course. This course gave the PE co-ordinator information that was subsequently passed onto staff in staff meeting time. It up skilled our teachers and provided a new long term plan of objectives for our school. We have invested £394 in new equipment and sports wear for our school. We purchased new leotards for our gymnasts, new bibs for PE lessons and bought dance costumes for the Big Dance event. 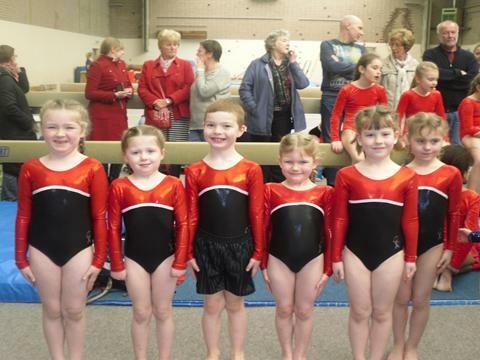 Leotards – we spent £257 on leotards for our year 1 and 2 gymnasts who took part in the key skills gymnastics competition for the first time and were placed 4th. The children loved competing against other schools and themselves. Big Dance – we bought black vest tops for the children who won best costume at the Big dance competition. PE bibs – we have replaced our PE bibs which has impacted on the teaching of PE in school – making it easy to group children using bibs that are fit for purpose. We have paid for an existing member of staff, Andrea Tate, to run football club for year 6 children after school. This has provided additional provision for 10 year 6 children to practise their football skills after school. It has increased participation in after school clubs and generated a lot of excitement about our school football team. In September 2014 we increased our club numbers to 21 year 5 and 6 children and an extra member of existing staff, Lucy Wright, began jointly running the football club. This has had a huge impact on our sporting performance within the cluster and we are now 5th in the league table compared to 10th last year. We are planning to use the sports funding to pay for Lucy Wright to continue running the club with Andrea Tate as we believe it is having a positive impact on our football teams results and attitude towards participating in cluster competitions. 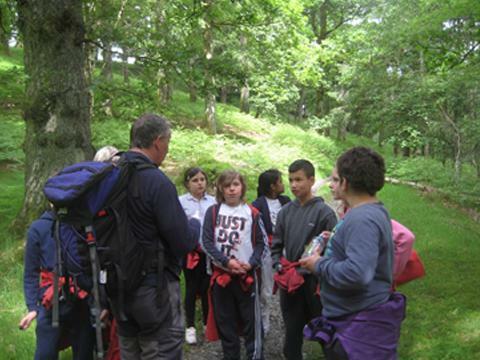 Year 5 went to Hawsend to complete archery, orienteering and outdoor activities. 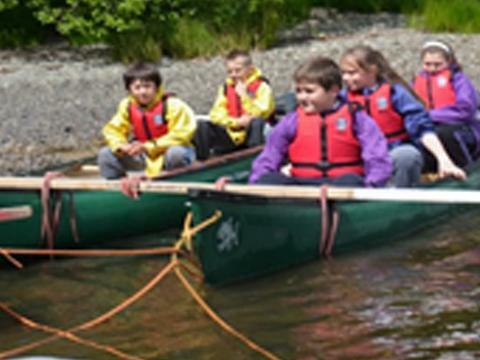 Year 5 children were able to take part in whole day of outdoor provision that was financed by sports funding money. As we have limited grounds and no grass playing field we struggle to complete the OAA strand of PE. The sports funding money allowed the year 5 children to be taught by qualified instructors and gave them a fantastic day of OAA; helping them to achieve some objectives of the OAA strand. The sports funding money enabled us to provide year 6 with a full day of water sports activities we could not provide internally. The children were taught by qualified instructors and many experienced a day they would not forget or repeat due to home circumstances.